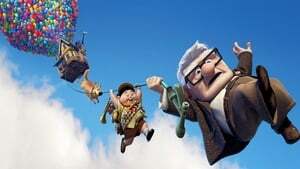 Carl Fredricksen is a little boy and a dreamer who idolizes the adventurer Charles Muntz. When he meets Ellie, who also worships Muntz, they become close friends. However Charles Muntz falls into disgrace, accused of forging the skeleton of the monster of Paradise Falls. He travels in his blimp to South America to bring the monster back alive but is never seen again. Eventually Carl grows up and marries Ellie. They promise each other that they would travel together to Paradise Falls and build a house there. Many years later, Ellie dies and Carl, who’s lonely, refuses to move from their house despite the offers of the owner of a construction company. When Carl accidentally hits a worker that damaged his mailbox, he is sentenced to move to a retirement home. However, he uses many balloons to float his house in order to travel to Paradise Falls. Adventure ensues.